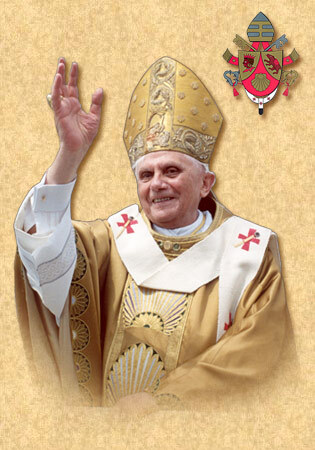 Help support a documentary film on Summorum Pontificum! Just one more day! The documentary film on Summorum Pontificum is now 81% funded, with just one more day remaining before the campaign ends. Let’s all help pitch in! Donate now by clicking on this link. May God bless your generosity! Yesterday the Church celebrated the feast of the first Apostle to suffer martyrdom, St. James, the brother of John, the son of Zebedee and Salome (St. Joseph’s niece and St. Cleophas’s daughter), nicknamed by Our Lord, along with his brother, Boanerges, the Sons of Thunder. St. James is called “the Greater” to distinguish him from the other Apostle of that name. James was one of the most beloved Apostles. It is Peter, James, and John who are privileged to be present at the healing of the daughter of Jairus, the Transfiguration, and the Agony in the Garden. These intimate experiences with Jesus prepared James to become the first Apostle to shed blood for Jesus. (1) On the 4th October Sunday (Oct 25) is the Feast of Christ the King (in the 1962 calendar used by the Traditional Latin Mass) and to celebrate, a HIGH Mass at St. Catherine’s is planned, with singing, etc. Anyone interested in singing in that St. Catherine Latin Mass should visit stcatherinelatinmass.org and there is a signup link there. Or you can email Jessica (themunns @ yahoo.com) and she will put you in the email loop regarding that. Fr. Timothy O’Brien, FSSP – 1st assignment: Nigeria! 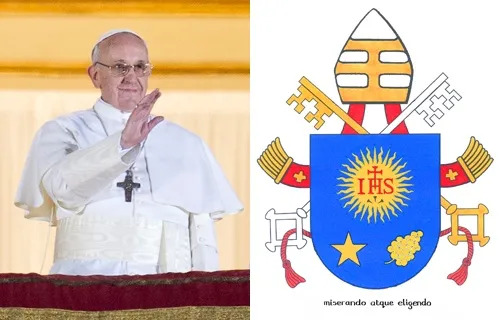 We have been recently informed that last Sunday (July 19), an announcement was made at the Mater Misericordiae Mission (Phoenix, AZ) that the recently ordained Fr. 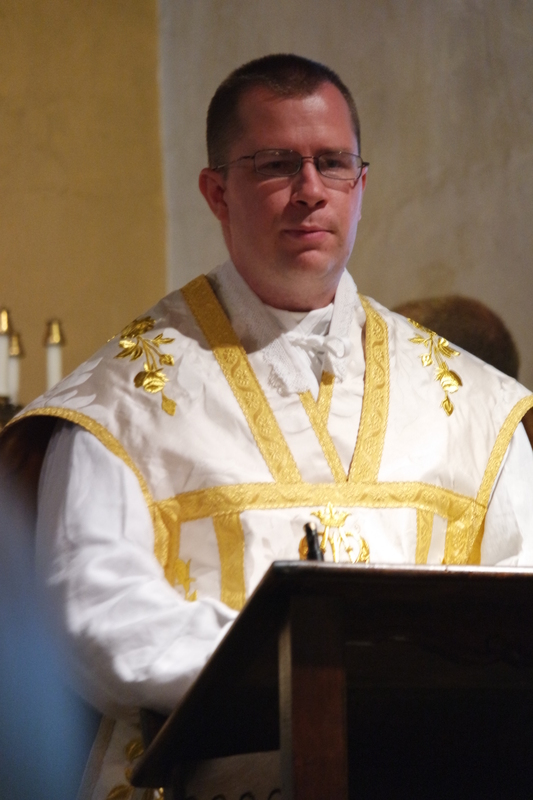 Timothy O’Brien, FSSP, will be going to Nigeria for his first assignement. 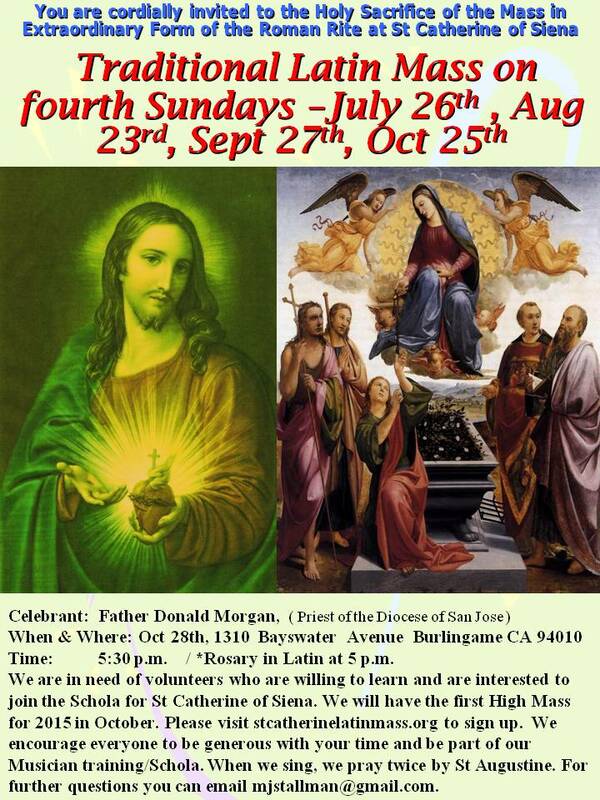 We were blessed to have covered some of his first Masses here in California (Kensington, Mission San Juan Bautista and Carmel) last month. In your charity, please offer your prayers for Fr. O’Brien and his new assigned parish. On Thursday, the Church celebrated the great feast of Our Lady of Mount Carmel. It was on July 16, 1251, that the Blessed Virgin appeared to St. Simon Stock to entrust to him her Brown Scapular, with the promise that “those who die wearing this habit will not suffer eternal fire.” This feast commemorates the apparition and the love and protection of Mary signified by the Scapular. The Scapular is the ancient Jewish garment worn underneath the clothes to signify that the Jew belonged to God and His Covenant. It is prescribed in the Book of Numbers and was worn by Jesus, Mary, St. Joseph, and all observant Jews. Our Blessed Mother has adopted this Jewish custom and fulfilled its usage to her own purposes. The Scapular signifies now that the wearer belongs to the Blessed Virgin Mary and is under her special protection. 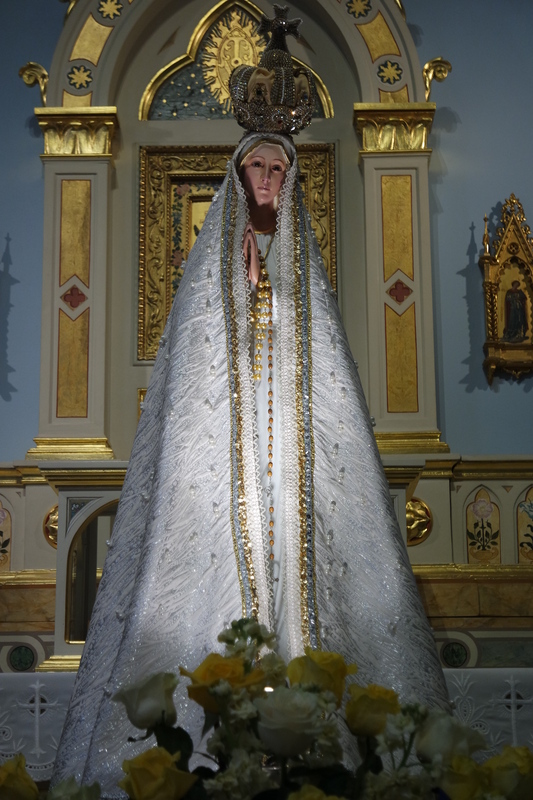 The National Pilgrim Virgin Statue of Our Lady of Fatima (organized by the World Apostolate of Fatima) is currently making the rounds in the Archdiocese of San Francisco this month of July, 2015. Please see below the schedule of churches that’s hosting the pilgrim statue. July is the Month of the Precious Blood of Jesus. 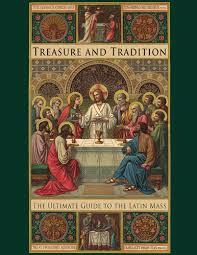 We celebrated this feast in the Extraordinary Form on July 1. The Blood of Jesus is the special object of our meditation and devotion this month, as Our Lady is in May and the Sacred Heart of Jesus is in June. The Blood of Jesus began as the blood of Mary. We can venerate Mary’s holy blood, made holy by its being hers. At the moment of Jesus’s virginal conception in the womb of Mary, a portion of the blood of Mary was assumed by the Second Person of the Blessed Trinity and became something totally new. This new thing that God did in Mary is the Divine Blood of Our Savior. We worship this Blood because it is the Blood of God. Indeed, we can say that, because of its union with the Person of the Eternal Word, the Precious Blood is God! 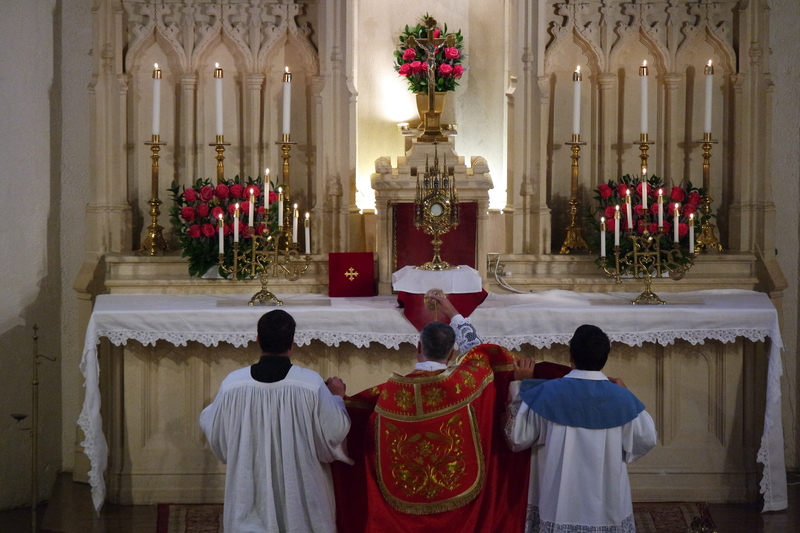 Video of last June 28, 2015 Sunday High Mass in the Ordinary Form at St. Edward’s Church (Newark, CA), which was also the last mass of Fr. Jeffrey Keyes as Pastor, where he had served the community since 2004. Please remember him, and the community of St. Edward’s in your prayers. 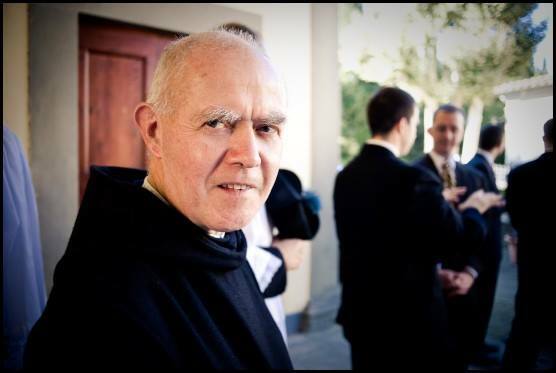 We request our blog readers to pray for Dom Yves Chauveau, OSB (Rev. 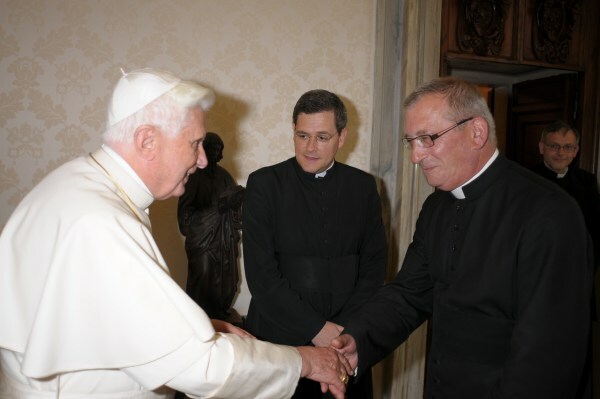 Father Prior of the Abbey of Our Lady of Fontgombault) and Rev. 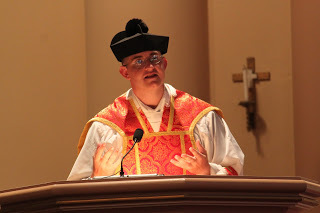 Father Denis Coiffet, a founding member of the Priestly Fraternity of Saint Peter (FSSP). Both recently passed away. May their souls rest in peace! (Original post from Rorate).